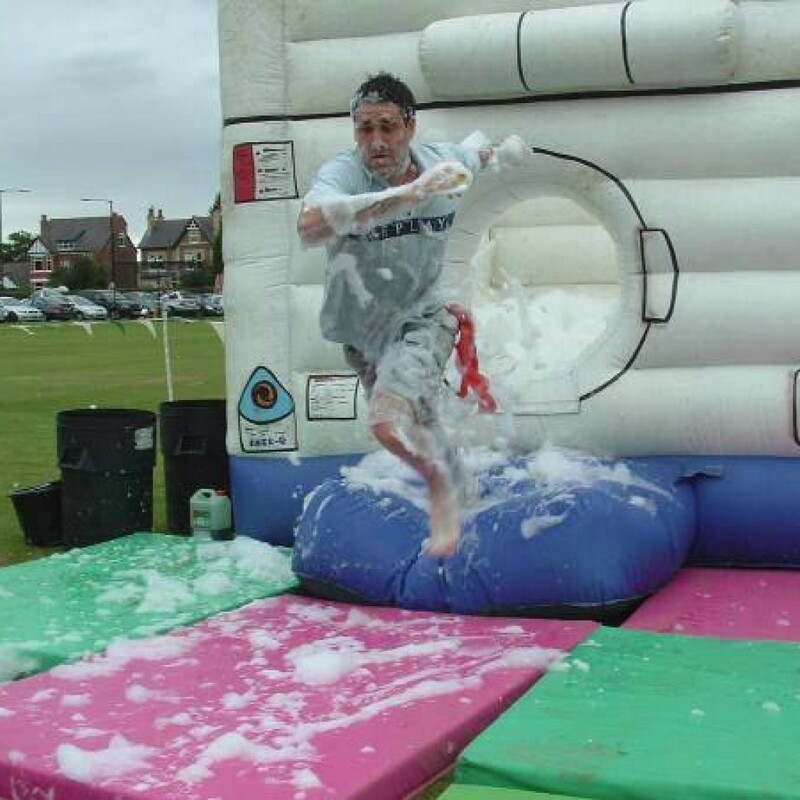 We are proud of our tradition of It's A Knockout! events, which we have been operating for over 27 years, and of the energy and enthusiasm they seem to instil in our clients. We are constantly up-dating our equipment and modus operandi to keep this great event both current and safe; so our rendition of this TV classic is bang up-to-date and very smartly presented. 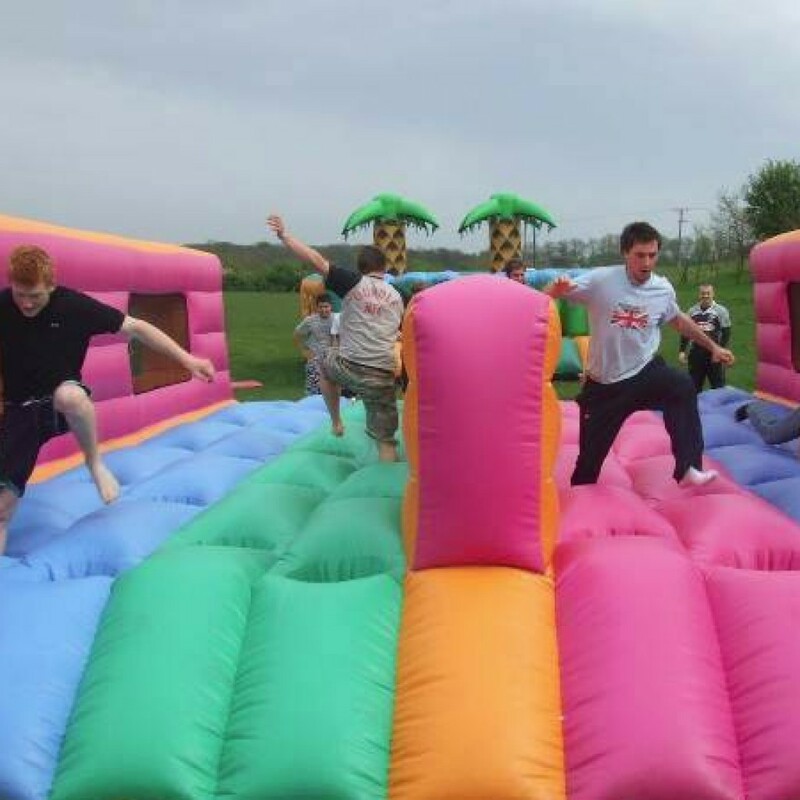 It's A Knockout! is an absolute hoot... for participants and spectators alike. Corporactive and their partners are members of the Eventia and the National Outdoor Events Association (NOEA). This provides you with the assurance of a safe, professional event. The relatively flat grass area at the Sports and Social Club will be ideal for the Games and we will create an arena roughly the size of half a football pitch. We will also require access to a water supply, for the limited amount required for some of the challenges. You will need to split your group into 10 to 12 teams. Teams will compete head to head on each game. 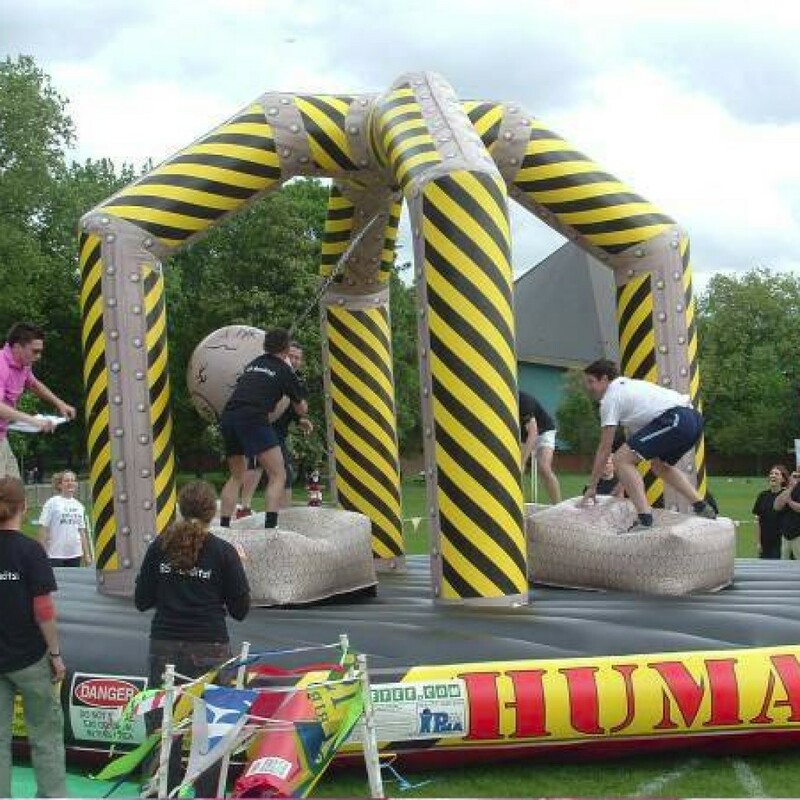 As it’s a knockout challenge, Teams will be eliminated during the course of the Heats, until the finalists are through. Those teams will take part in a thrilling and fast-moving, head to head, finale to determine the ultimate performance of the day. Ever wanted to know how a Hamster felt… then now’s your opportunity! 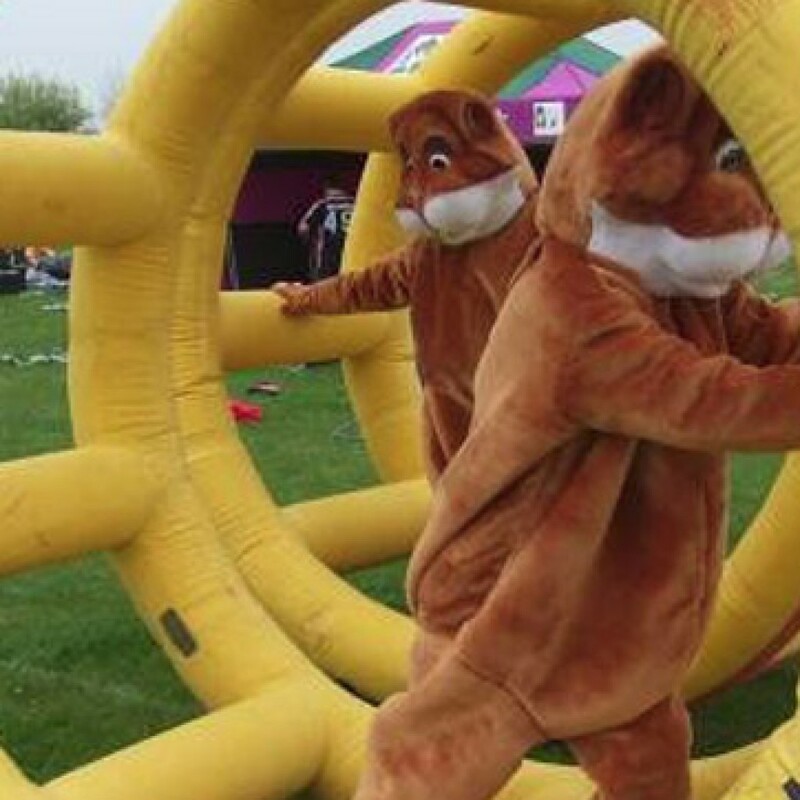 Participants, helped by teammates dressed as giant hamsters, climb inside our huge inflatable wheels. The objective is to negotiate their way around the cornfield obstacle course. After handing (or pawing!) over to their team mate, the fun begins again! The winning team are the hamsters who complete the course first, as a complete team and with all tasks completed! Because there “ain’t no mountain high enough”… we’ve built an inflatable substitute! In an attempt to recreate Hannibal’s exploits you’ll be required to carry jigsaw pieces across the obstacle. Solve the puzzle on the other side and your pioneering exploits will earn you points. Ah… But… It will definitely NOT be that straightforward, as you’ll find other “little irritations” to contend with on the way! Catapult to victory using our uniquely designed bungee mechanism that will fire water-soaked sponges to your waiting colleagues who will use them to unsettle the opposition by scoring direct hits at vital moments! The giant inflatable castle surround makes this extremely visual and involves the whole team. A superb head to head round, with the added amusement of soaking the other team. But remember, no mercy will be shown when it is their turn for the sponges! This 4 podium game really does test balance, skill and strength – the most accurate way to describe it is like a giant wrecking ball! However, the platform upon which you will be working from is not exactly stable! With this ultimate combat challenge, the oversized wrecking ball is your only weapon. Members from each team go head to head, with the winners the team who have devastated the opposition the most. The problem is… you are just as likely to knock yourself of the platform, as you are the opposition! It’s laying time at the farm… Your team have to assist the Giant Chicken in collecting as many eggs as possible from the ‘Mother Hen’ in the chicken shed. It’s no easy task with giant wings getting in the way and straw bales impeding your progress. The problem is… as fast as you collect the eggs, the other team are doing their best to either break them or knock them out of your hands! Oh bother! There’s no accurate way to fully describe the mayhem and stupidity of this challenge! And, if you see showering as an inefficient process you will be delighted to play our colossal Human Washing Machine game. Retrieve the numbered puzzle pieces in the right order from the foamy lather and form the picture correctly to see your team to victory! Sound simple? 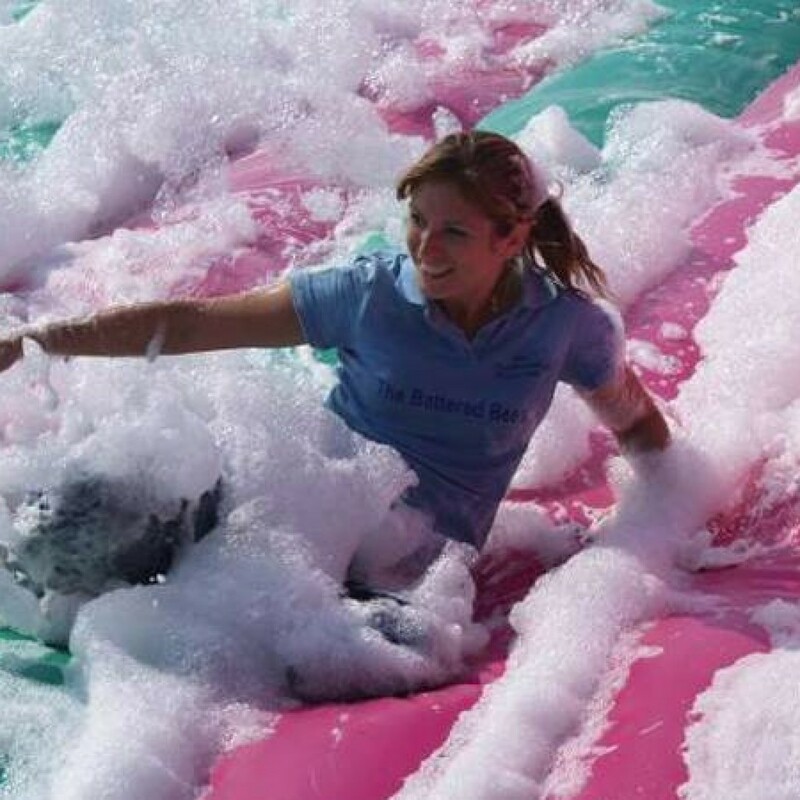 Well, have you ever tried running on inflated wet vinyl, covered in slippery foam, which you then have to dive into (without goggles!) and retrieve the puzzle bits? No… we thought not! A crazy, energy-sapping, relay with an utterly ridiculous plot! A relay where team mates, working in pairs, cross the inflatable stepping stones, taking care not to trip up on the way. Why so careful not to trip? Because you will be wearing helmets with containers of water on top! Once across, team mates must work together to fill their measuring cylinder and the winners will be those collecting the most water by the end of the game. Beware, as ever, the sabotage of the opposing teams!